Mobile is huge – just about everyone acknowledges that. And just about everyone wants a piece of the pie. 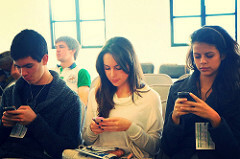 Businesses realize that in order to stay ahead of the competition, they need to incorporate mobile in their strategy. But in a tearing hurry to get on this mobile bandwagon, chances are, there are many things that are not being done right. Here are some common mistakes that anyone can make, and everyone should watch out for! You might run the best advertising campaign ever – but if you don’t have a mobile-optimized landing page, the whole effort is lost. Don’t send your users to wrong pages or pages with irrelevant information. It is a very bad idea to mirror your actual website on your mobile screen. It is very easy to make the mistake of running after every new technology that pops up and lose sight of why one is thinking mobile, in the first place. Start with centering on why you went mobile and then work from there, adding those technologies that will enable this to take shape and bear results. Advertising that works, is advertising that is native. But if you do on the mobile, what you would do on a desktop, (place ads that take up space, that are irrelevant and interruptive) there is a very good chance that it won’t work at all. It is very important to track each initiative and tool to see what works and what doesn’t – only then can you tweak it to optimal effectiveness levels. Don’t stop with just tracking how many ‘clicks’ you have got. You can track the user’s location – even the kind of device he uses – so you will know what will work for him and what won’t. Making users type too much on their phones. It is definitely not a good idea to expect customers to key in a lot of text using their phones. Fat and clumsy thumbs and small buttons and too much textual input just don’t mix. Keep it simple with buttons that are easy to spot and use. Providing customers with the wrong kind of information. Mobile devices are exactly that – mobile. Think of mobile customers as those who are on the move. The kind of information that such a person would be looking for, is very different from someone who is browsing content from the comfort of a couch on a desktop or laptop computer. It is very important to know you customers and be able to get in touch with them when you want to. You could use tools and tech that will gather data on the one hand, and give your users simple surveys or pop questions. Again, don’t make them type – give them multiple choices as answers with clickable buttons that they can use easily. And make sure you let them know that you would use the data responsibly. These days, there are many ways to engage with a customer on mobiles – everything from text messages and QR codes to emails. These can link to various destinations like landing pages, web pages, videos, apps, etc. It is very important, in a situation like this, to make sure that the links you provide connect correctly to the content or the pages that you want them to. And it is very important that all parts of this unit, work. On various kinds of mobile devices. It is very important to test this ahead of time and make sure that it works. Don’t send a link to an iPhone app to a Blackberry user! Mobiles Apps are a big part of mobile marketing – you have spent your energies in creating what you think is the best App ever! But with more than a gazillion apps on every kind of app store there is, chances are the world won’t find yours, unless you promote it. And this means more than just listing it with some ratings. And once you get someone to use your app, your promotions must not end there – you need to make sure that your users continue to use the App. This is one thing every mobile marketer needs to be careful about. It is great to get all kinds of data about customers and get to know a lot about their lives, but it is a very thin line between rocking and creepy. With all the data, you can send highly targeted personalized messages to your customers. But you should know how much is too much. A little too much, and you would run into the danger of losing your customer, just like that! You can have the best app ever or a very immersive mobile experience that you are offering to your customers – but there are times when a customer wants to talk to the business. So it is very important to list contact details – and most importantly, a Call Button – that he can tap to call. Make sure your site or webpage is mobile friendly – make sure it is responsive and loads quickly. Any delays can be fatal. Don’t write huge epics when it comes to the content that you share – break it up into chunks that can be easily consumed on 6 inch screens. Use visuals and videos to get the attention of your customers – but use versions that load well. You have less than a few seconds to get the attention of your customers – use them well! Location-based marketing has evolved into a sophisticated personal art form thanks to mobile devices. Use this wisely and well. This may not the total list of what not to do, or what to do – but this is a good place to start.